Hi friends, It’s CASE-ing the Catty time. Yes, it’s that time of the week when we look to a Stampin’ Up! catalogue for inspiration, and this week it’s the Sale-a-bration brochure. We looooove Sale-a-bration. Not just because we can all earn free gifts when we shop for new craft supplies, but also because we get lots of lovely new products to play with. Want to learn more? Click here. After flicking back and forth a few times, I kept coming back to the same project. Right back… to the front cover, in fact! The one with all that fussy cutting! It’s adorable, no doubt about it. But oh my all that fussy cutting just wasn’t going to happen in my craft room. So I decided to challenge myself this week to make one just as sweet but a little easier to replicate. The stamp is a Sale-a-bration option (free with a AUD$90 purchase) called Beautiful Peacock. Peacock feathers are stamped on a die cut Stitched Shape circle, and only the body is fussy cut (breathe a sigh of relieve over that one). This turned out to be a great compromise because it added detail without taking hours. The embossing paste is the new Shimmery Paste. It doesn’t really show up well in the photo, but it is so sparkly! And almost translucent so you could definitely add colour to it and it will keep its sparkle. Are you curious about the patterned paper? 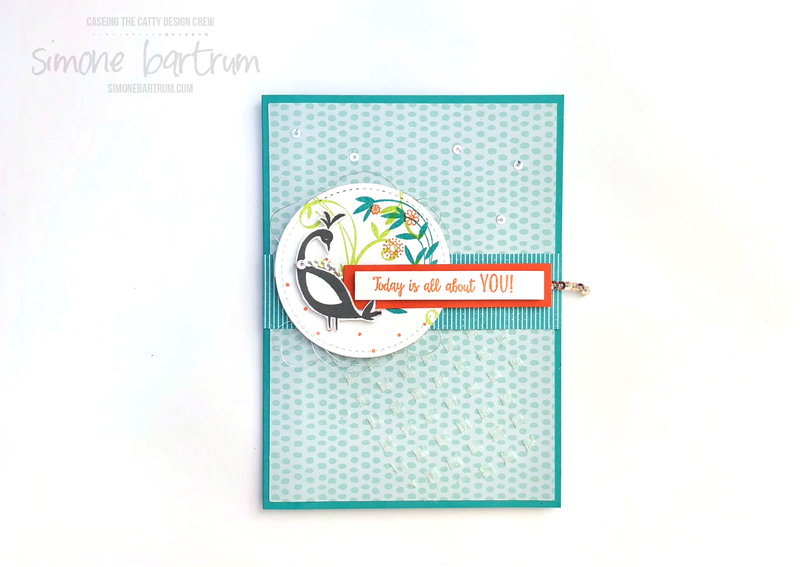 It’s actually a card base – one of the free Sale-a-bration Tutti Frutti card and envelope packs. This is another great Sale-a-bration choice. Cut them in half, which is what we did here, they go twice as far! One thing that nearly caught me out was the strip of patterned paper across the middle. Finally I found it, right there in the Bubbles & Fizz Designer Series Paper. And you guessed it, this is another of the FREE Sale-a-bration options. Wow, I just realised that almost entire card is made up of Sale-a-bration freebies. Nice! And finally, here’s a hot tip for you: If you have a big wish list and plan to earn all three gifts, then it’s best to put in a single $270+ order instead of three separate $90+ orders. If you do it at the same time, you’ll qualify for Stampin’ Rewards because the order is over $250. How cool! That will give you at least 10% of the value back in free product of your choice! Next on the hop is my friend Julia, and I’m sure you’ll enjoy visiting her blog here. Want to join us? Just click on the link below and request to be added to our closed Facebook group. Lots of ideas in there. I love your version! That fussy cutting is crazy on the original, your version is much more easier to make! I love your CASE of this card Simone. I’m not a huge fan of fussy cutting either. Thanks for the tip on cutting the Tutti Frutti cards in half and having twice as many, great idea. I love love love your compromise!! And thank you for finding that DSP across the middle!! I really was wondering! Love your work, and I’m totally inspired!! 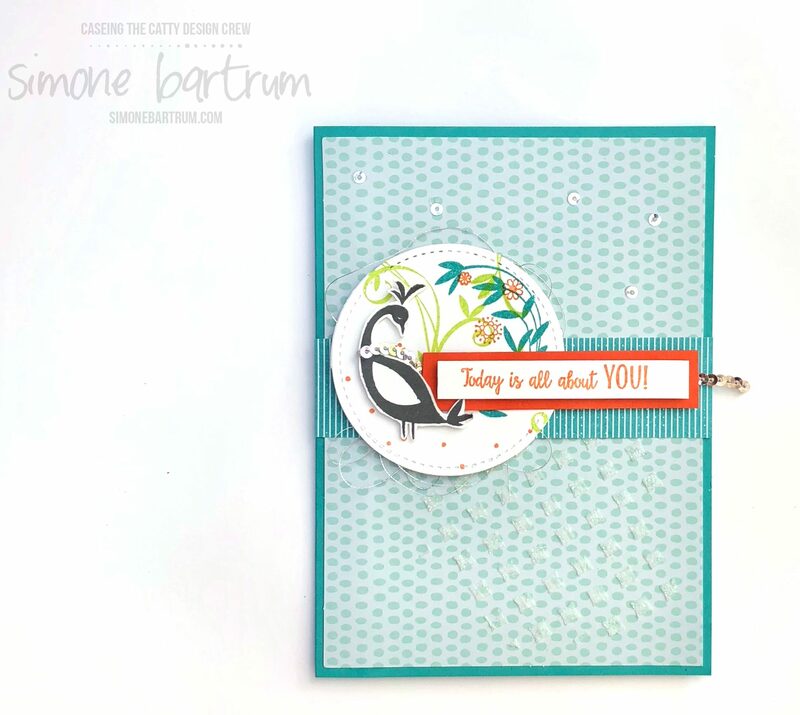 Love your card and fabulous idea to reduce fussy cutting! Those bold colours are great Simone. Seems to give the image more definition. Great CASE Simone. Just goes to show that you can get just as beautiful results without the fussy cutting! Such a sweet card, Simone. Love all the little details you have included.